Having a routine to follow when it’s time to nap or sleep allows your baby to know what’s coming, it calms them (and you) and gets them ready for their nap or bed time. During the day our nap time routine is super simple but Remi knows every time what’s coming and as I slip her in her swaddle she smiles and rubs her face knowingly that it’s time for a nap (even if it is only 30-45mins sometimes #catnapper). I’m not here to talk about the way you put your baby to sleep, I will leave that to you and your baby or if it’s a real struggle I would suggest speaking to a trained sleep consultant or similar professional. At the moment we chose to feed to sleep for most sleeps and we are happy doing so but I know that’s not for everyone or every baby. Just don’t forget that every mum and every baby is individual and has different need. At night I have found it particularly important to have the same routine to settle Remi and have her know that its “bed time.” It also helps to keep life manageable with a toddler and baby. Doing dinner first means we can make a mess knowing we will be bathing straight after! 2. Bath . Sometime our girls will bathe together for a bit of fun or otherwise Millie will go first and once she’s out David will look after Millie and that allows me to spend time bathing Remi. There is something special about that one on one time at bath time. For bath time we use Eco Store Baby Body Wash. It is so gentle and soft on babies sensitive skin. Designed to match the natural oils and amino acids of babies’ skin, the ecostore baby range contains conditioning agents to help keep skin soft. For both the girls hair we have been using Eco Store Baby Shampoo. I have been using this for a while now and have noticed how much less dry scalp Remi has had since switching brands. Baby massage has been proven to help baby sleep, develop and also to help bond with their Mum or Dad. We do this for a few minutes on the change table after Remi’s bath making sure the room is only dimly lit with a night light we find works best. It’s also when we sing her a lullaby. It’s such a great way to calm baby down and get them ready for bed. We use the Eco Store Baby Moisturiser for her massage. It contains a nourishing blend of olive, jojoba and coconut oils in a shea butter base to soften and condition baby's skin, protecting them from dryness and irritation. It’s so soft and gentle on their beautiful baby skin plus it smells so beautiful and calming. As Remi is sleeping through the night we make sure to put a barrier cream on her before placing on her nappy at night to protect her against any rashes as she doesn’t have a nappy change overnight. We use the Eco Store Nappy Balm. This has to be the best Nappy Balm I’ve ever used and it contains no nasty chemicals and toxins which is so important. 5. Turn on the white noise. You can either use an app on an iPad, buy a little white noise machine or our bassinet actually has white noise so I turn it on just before I start to feed her. Next I place Remi in her Love To Dream Swaddle – she now knows what’s coming and is ready to fall to sleep. This is where I feed Remi to sleep making sure she has a really big feed and is nice and full. If you don’t feed to sleep then you could pop baby in her/his bassinet or cot with or without their dummy, comforter, rock gently or do whatever you need to do to help them fall asleep comfortably. Once Remi is full and either super drowsy or asleep I place her gently in her bassinet and make sure it’s completely dark in her sleeping space and that the white noise is on. Pray and hope for a full nights sleep!! Once I hear Remi’s tired cues I know its time to start our little routine for nap time. These little routines are nothing fancy or complicated but I believe they provide enough for Remi to understand it’s time for sleep. 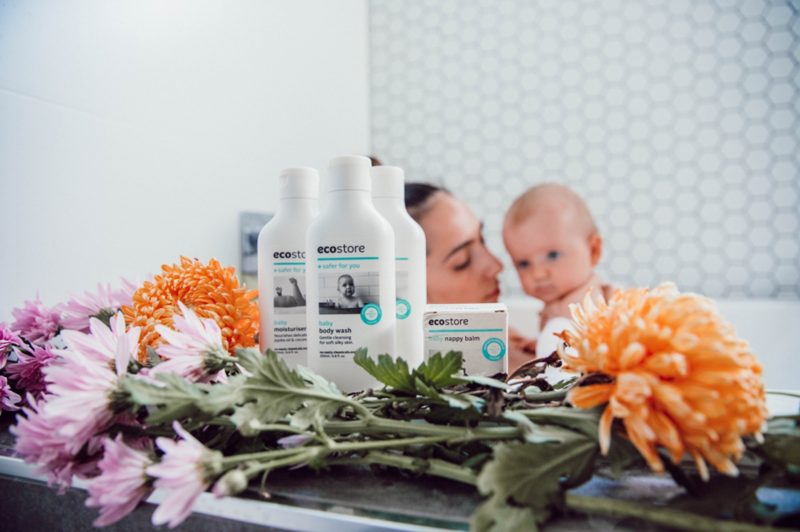 Over the last 6 months or so I have been trying to reduce the toxins in and around our home and our baby bath and skin care is a high priority when it comes to this which is why we have made the switch and use ecostore products for our girls. 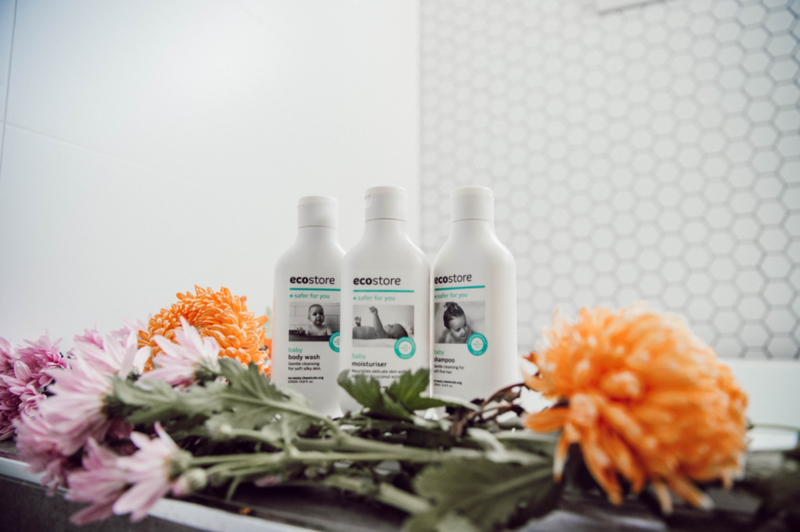 Ecostore takes pride in producing outstanding quality products that are made from naturally derived ingredients and are safer for us and our world. Ecostore baby products are full of nourishing natural ingredients such as creamy goat’s milk and essential oils that nourish and protect a baby’s delicate skin. Designed to match the natural oils and amino acids of babies’ skin, the baby range contains conditioning agents to help keep skin soft. We love and trust ecostore baby products as they are made from naturally derived products and made specifically for babies skin. You can buy ecostore baby products from Woolworths supermarkets or Chemist Warehouse. This blog was written in paid partnership with ecostore but I would never promote anything I don’t love or use myself.